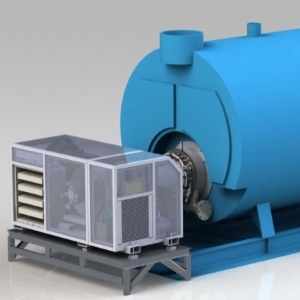 Project: A 100 kW Combined Heat and Power System based on a micro gas turbine and Altex Technologies' patented burner design. Project progressed from clean-sheet system design to a field demonstration of a fully-functional Beta unit in less than two years. The system leveraged conventional boiler infrastructure, but increased fuel utilization efficiency by generating electricity and hot water/steam. Role: Program Manager and Lead Mechanical Designer. Directed a team of team of engineers and technicians, managed budgets and scheduling, presented to existing and potential financial backers, and led mechanical design activities. Funding Source: California Energy Commission, US Department of Energy, internal sources. Project: To expand my prototype fabrication capabilities, I purchased a semi-complete Taig milling machine in 2016. I redesigned the controls and wiring harness, incorporating many features not provided with the machine as-purchased, including safety interlocks, limit switches, and LED lighting. I also designed a full enclosure with an aluminum extrusion frame and polycarbonate panels. All fabrication work was performed in-house. The controller is based on a Gecko-brand drive for all four axes, and interfaces with EMC2 or Mastercam software. It can be controlled semi-manually through conversational CNC programming, but for more complex operations, I use HSMWorks to create toolpaths directly from Solidworks part files. The mill was put into service in February 2017, and is in frequent use now, producing prototype parts for my consulting clients. Role: Engineer, fabricator, and now operator. Project: Refine an inventor's breadboard design of a novel medical device into a functional and adjustable prototype. The inventor provided a design brief with functional requirements, including precise targeting of eighteen sensors, electronics interfaces, and desired mechanical functions. The device was designed to achieve these goals, and included several adjustable features to allow fine-tuning of the device without major iterations of the hardware. The device was designed for low-cost 3-D printing, and off-the-shelf components were utilized for all hardware and wiring. Role: Complete prototype design, fabrication, and assembly. The final deliverable was a 3-D design with engineering drawings, and a functional prototype. The design permits replacement of all sensors and internal components with no special tools. All wiring was pre-tested prior to delivery, and a package of spare hardware was provided with the system. Project: A refrigerant-free cooling system that utilized waste steam to chill water. The system integrated a Liquid Ring Vacuum Pump, a custom evaporator vessel, and steam ejectors to chill water to near-freezing temperatures. Water was the sole working fluid (no CFC's or HFC's), and the system could be customized to pre-cool combustion air for a Combined Heat and Power System, or function as a stand-alone HVAC system. Role: Program Manager and Lead Mechanical Designer. Directed a team of team of engineers and technicians, managed budgets and scheduling, led mechanical design activities, and supervised all fabrication and testing. Project: A compact chemical processing system that converted liquid fuels (ethanol, diesel, gasoline) into a hydrogen-rich fuel stream. The reformer was designed to fit under the floor of a compact automobile, and included all catalysts, burners, and Balance of Plant components. On-board reforming permits use of the existing liquid-fuel infrastructure, while still achieving most of the efficiency gains of hydrogen fuel cells. Role: Lead Mechanical Design Engineer. Responsible for design and delivery of major components and subsystems. The fast-paced development process utilized rapid manufacturing technologies, including laser and water-jet cutting, CNC machining, and extensive pre-fabrication analysis with finite element analysis (FEA) and computational fluid dynamics (CFD).